RISING STARS #5: A 2.04m tall right back from Bækkelaget is among Norway’s greatest assets at the upcoming Men’s 20 EHF EURO in Denmark. Rød means red in all three Scandinavian languages: Norwegian, Swedish and Danish. 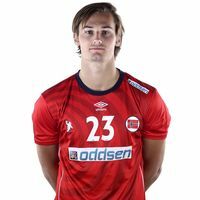 And maybe some of Norway’s opponents will need to call “red alert”, when they run into Magnus Abelvik Rød at the Men’s 20 EHF EURO in Denmark from 28 July to 7 August. The 19-year-old right back from Bækkelaget Håndball Elite is one of the players that Norway trusts most ahead of the tournament. Not only is he towering at a height of 2.04 metres, he also possesses a hard and variable left-hand shot. He has also amassed experience in the Norwegian league as well as in the senior national team already. With Bækkelaget, he reached the semi-finals of the Norwegian play-offs after defeating league winners Arendal in the quarter-finals. And in the national team the talented right back made an impressive debut in a friendly against Belarus on 3 June in Oslo, scoring four goal’s in Norway’s 36:33 win. Johan Zanotti, the coach of Norway’s under 20 team is also happy to have the 19-year-old in his team roster. “Not only has he more experience than most players at his age. He is also a physically strong and highly versatile player who has a great shot from the right back in attack and who can also cover the right back in defence very well. He is definitely one of our most important players,” he says. Magnus Abelvik Rød himself takes all the praise with modesty: “I try to use my versatility in the interest of the team. Of course, it is an advantage for me and for the team, that I can play at both ends of the court, and that I can cover the right back as well as a position in the central defence. “Furthermore, I think I can contribute with some experience and calmness after my league season with Bækkelaget and my debut in the national team. I’m sure that this experience will come in useful at the European Championship in Denmark,” he says. Team Norway for the Men's 20 EHF EURO with Magnus Abelvik Rød third from the left in the top row. Norway were drawn to Group C alongside Netherlands, FYR Macedonia and hosts Denmark. The first two teams of each group qualify for the main round. “I think we have a very good chance to do better than we did last year at the World Championship at which we finished sixth. We are stronger now, and I also see it as an advantage for us that the championship takes place in another Scandinavian country. “We will be playing in a familiar environment, and that we will not have to travel far. All this should be in our favour, says Abelvik Rød. The 19-year-old is in no doubt about his ambitions for the future. “At some point, I want to play in a European top club and play in the Champions League every year. A club in the German Bundesliga or a top club in France would suit me well. “Of course, I also dream of the senior national team, and that dream has obviously not become smaller after I have had my debut there.